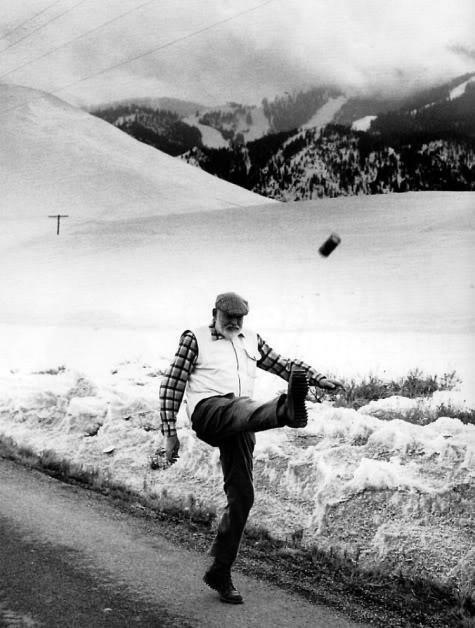 May 2013 be somewhat different! A Very Happy 2013 to all readers of this blog! Update: fresh closing data: Nasdaq Comp up almost 16% y/y, DJIA up 7.3% and S&P 500 up 13%. I am including the above primarily to re-enforce the fact that the issue of total economic debt I am continuing to raise in relation to Ireland and the rest of advanced economies is now becoming mainstream. Markets. But some segments still “under pressure” (banks and interest rates). 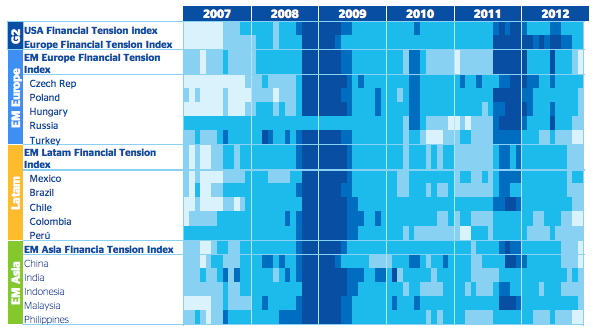 Emerging Markets among the most benefited markets during the quarter. The Central Banks actions leads EM Europe below the neutral area thanks to the diminishing Euro convertibility risk. 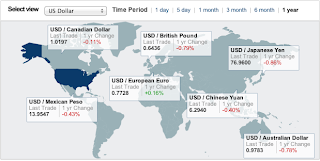 Asian and to a lesser extent Latam financial pressure enter also in the very low tension area." My view - don't be complacent on Latin America and some Asian markets - keep an eye out for Grey Swans (see my note here). Nice performance for the Peripherals, but... caveat emptor - CDS markets might be singing a song of no content (see here). In the previous post, amidst the excitement of the aggregate figures reporting, I forgot one small, but revealing chart. Now, recall the FG/LP election campaign promise of 'not another cent' for the banks?.. 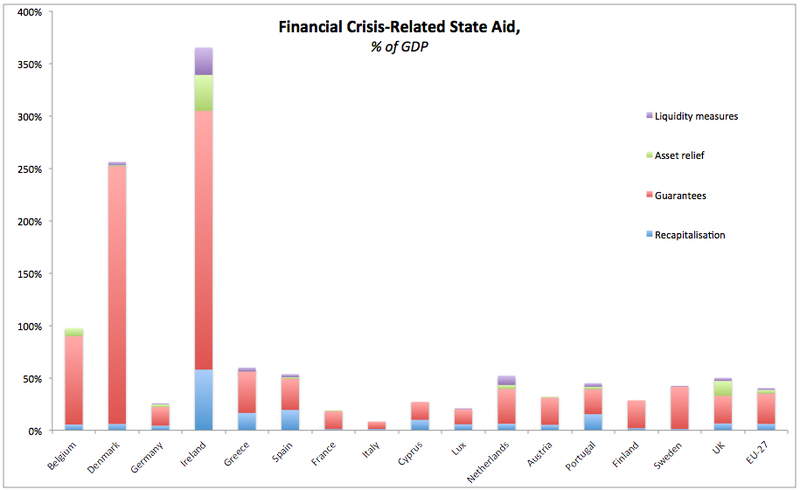 Yesterday, the EU Commission released updated analysis of state aid expenditures, covering 2012 data. 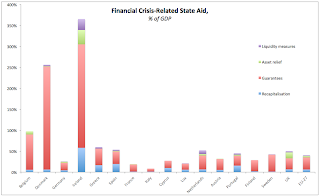 The document, titled "State aid Scoreboard 2012 Update Report on State aid granted by the EU Member States - 2012 Update" is available here. 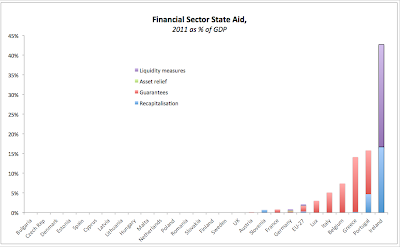 "Between 1 October 2008 and 1 October 2012, the Commission approved aid to the financial sector totalling €5,058.9 billion (40.3% of EU GDP). 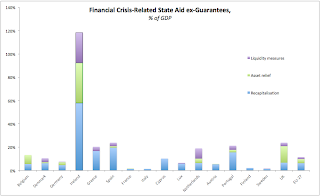 The bulk of the aid was authorised in 2008 when €3,394 billion (27.7% of EU GDP) was approved, mainly comprising guarantees on banks’ bonds and deposits. After 2008, the aid approved focused more on recapitalisation of banks and impaired asset relief rather than on guarantees, while more recently a new wave of guarantee measures was approved mainly by those countries experiencing an increase in their sovereign spreads, such as Spain and Italy. 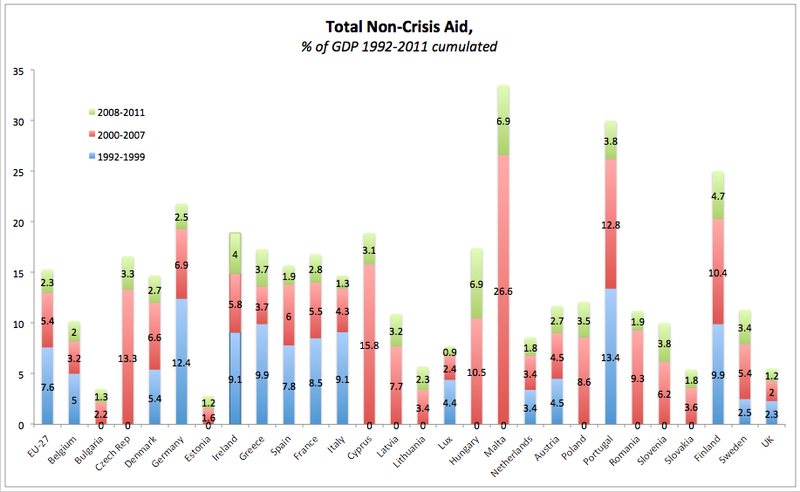 Between 2008 and 2011, the overall amount of aid used amounted to €1,615.9 billion (12.8% of EU GDP). Guarantees accounted for the largest part amounting to roughly €1,084.8 billion (8.6% of EU GDP), followed by recapitalisation €322.1 billion (2.5% of EU GDP), impaired assets €119.9 (0.9% of EU GDP) and liquidity measures €89 billion (0.7% of EU GDP)." In other words, keeping up the pretense of solvency in the legacy banking system of the EU (primarily that of the EA17) has created a cumulated risk exposure of €5.06 trillion (over 40% of the entire EU27 GDP). With such level of supports, is it any wonder there basically no new competition emerging in the sector in Europe. 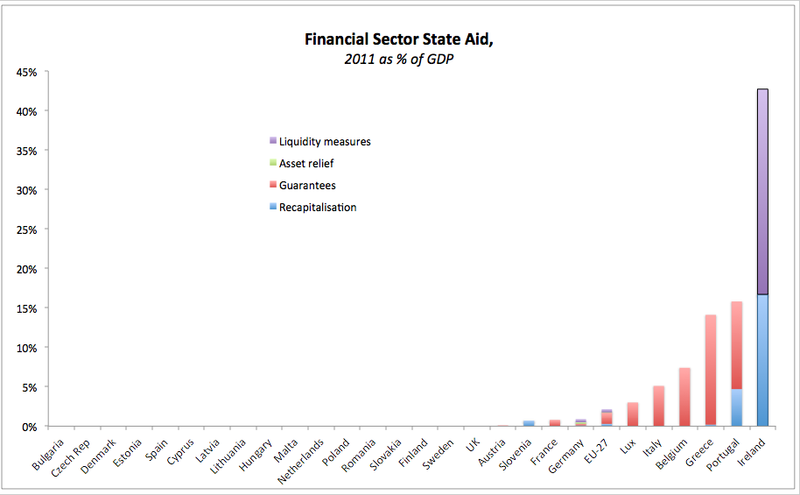 "In 2011, the Commission approved aid to the financial sector amounting to €274.4 billion (2% of EU GDP). The new aid approved was concentrated in a few countries and involved guarantees for €179.7 billion, liquidity measures for € 50.2 billion, recapitalisations for €38.1 billion and impaired asset relief for € 6.4 billion. The overall volume of aid used in 2011 amounted to € 714.7 billion, or 5.7% of EU GDP. Outstanding guarantees stood at € 521.8 billion and new guarantees issues amounted to €110.9 billion. Liquidity interventions amounted to € 43.7 billion and new liquidity provided in 2011 stood at €6.5 billion. Recapitalisation amounted to € 31.7 billion. No aid was granted through the authorised impaired assets measures." Some illustrations of historical trends. 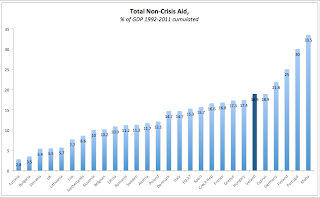 Amongst the euro area 12 states, Ireland has the fourth highest level of state aid over the period 1992-2011 and this is broken into 5th highest in the period of convergence with the EA12 (1992-1999), 5th highest for the period of the monetary bubble formation (2000-2007) and the second highest for the period of the crisis (2008-2011). 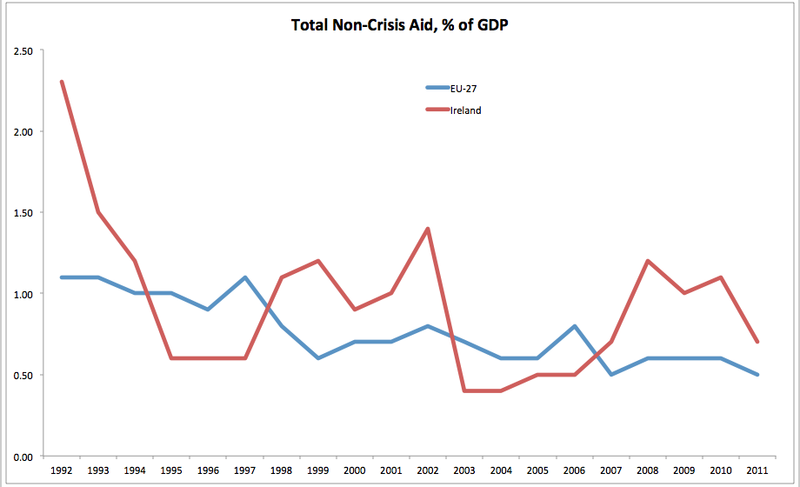 Relative to EU27, Irish state aid was above EU27 average in 1992-1994, 1998-2002, 2007-2011. 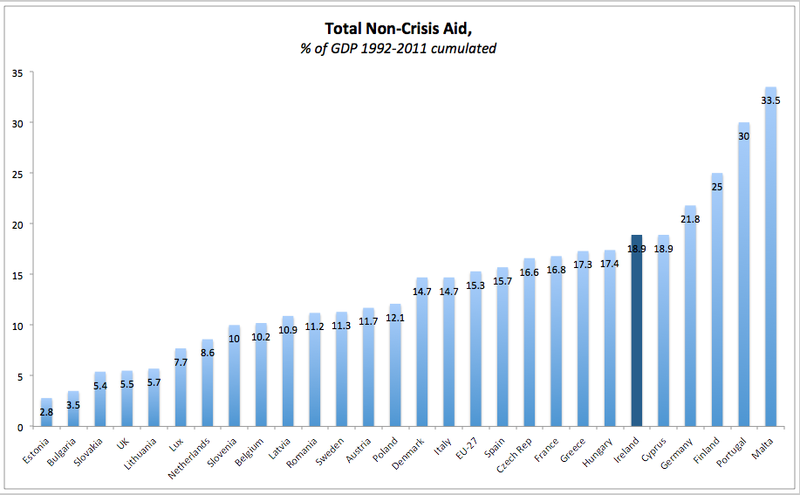 In other words, Ireland's state aid was in excess of EU27 for 13 out of 20 years. And that despite the fact that our income convergence to the EU standards was completed somewhere around 1998-1999. The overall level of supports for financial sector in Ireland is so out of line with reality that our state aid to insolvent financial institutions stood at 365% of our GDP in 2011 or roughly 460% of our GNP. 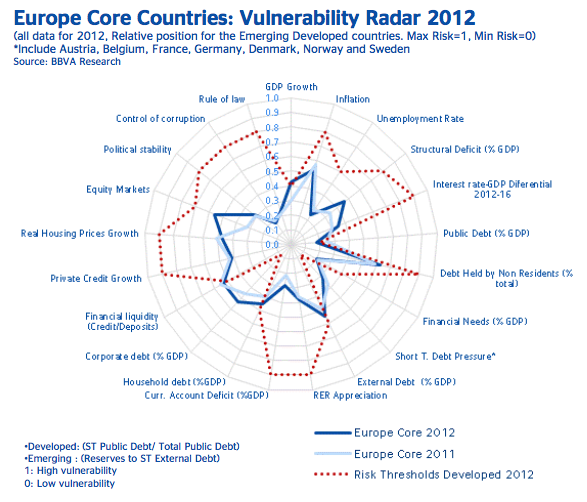 In other words, relative to the size of our economy, the moral hazard created by the Government (and Central Bank / FR) handling of the financial crisis in Ireland is now in excess of measures deployed by the second and third worst-off countries in EU27 (Denmark and Belgium) combined. 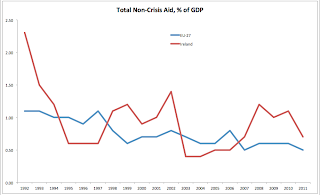 The chart above shows that Guarantees amounted to 246.7% of GDP in Ireland, almost identical to 245.7% of GDP in Denmark. 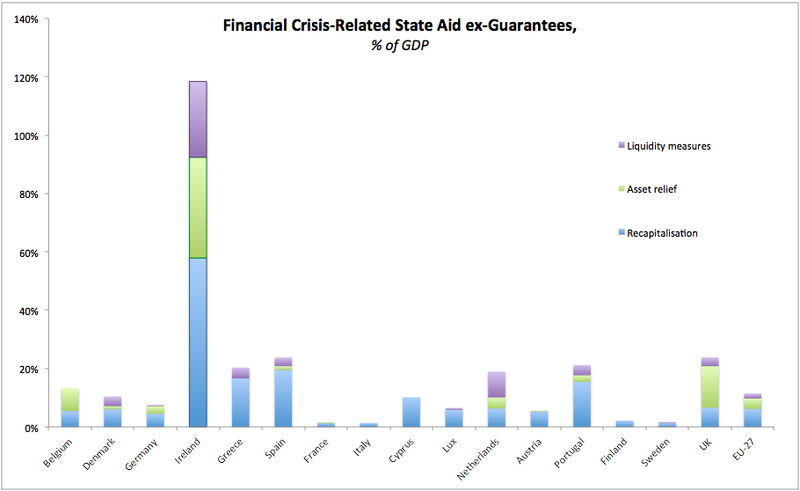 Which means that our Guarantees were basically equivalent to those of seven worst-off Euro area countries combined. 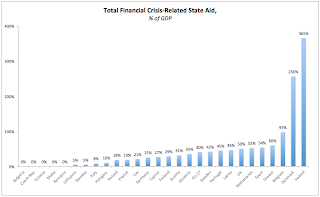 Ex-Guarantees, Irish State supports for the financial sector were more than 10 times the scale of EU27 supports and at 118.4% of GDP amounted to almost the combined supports extended by all EA12 states (123.2% of GDP). 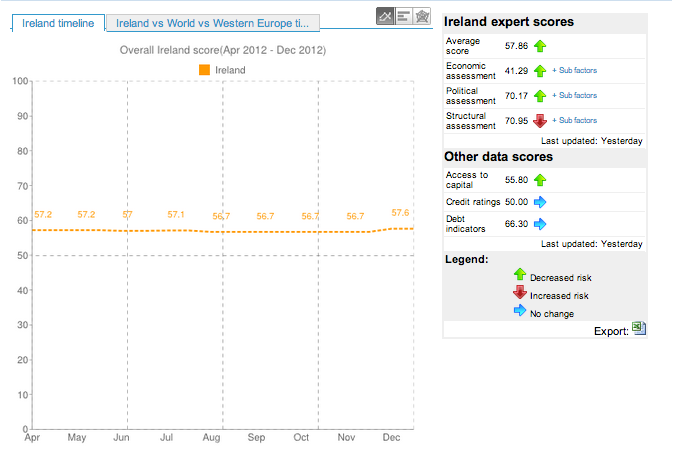 Note that Ireland is just one of 3 countries receiving an upgrade. 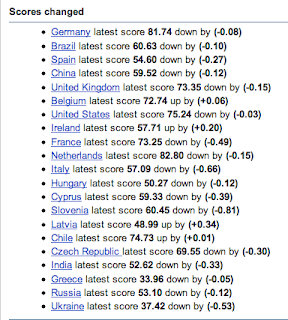 Not a hugely significant development, but a nice step - 1 place up in the global rankings, now to 45th highest risk country (meaning there are 44 countries that rank less risky than Ireland). 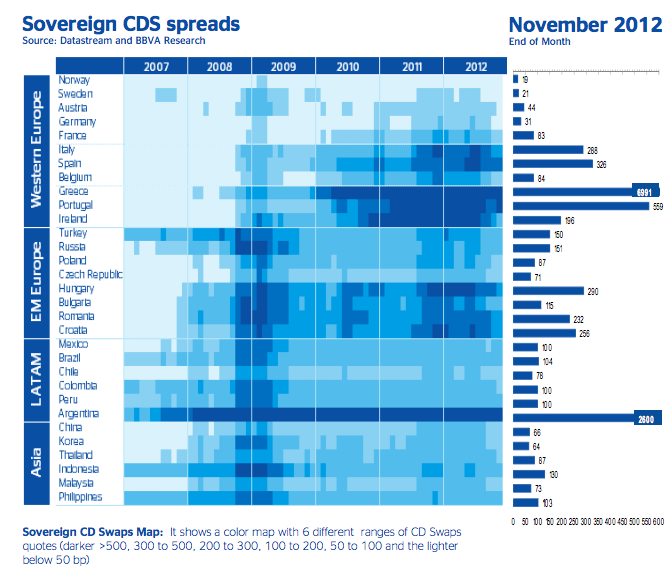 Do note, however, that our systemic risk scores in Structural Assessment has slipped, while Credit Ratings and Debt Indicators remained static. "The authorities should outline the remaining consolidation measures for 2014–15 around the time of Budget 2013 (MEFP ¶8). 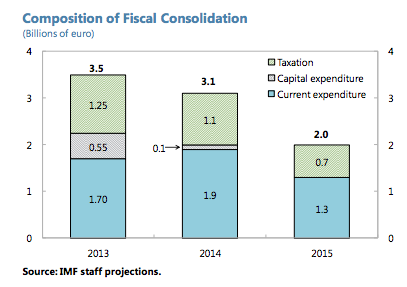 The program envisages additional consolidation of 3 percent of GDP over 2014–15. Taking into account the measures already specified for these years (such as on capital spending), and carryover savings from earlier measures, new measures of about 1½ to 2 percent of GDP remain to be identified for 2014-15." "To maximize the credibility of fiscal consolidation, and to reduce household and business uncertainties, the authorities should set out directions for some of the deeper reforms that will deliver this effort. These could include, for instance, on the revenue side, reforming tax reliefs on private pension contributions; and on the expenditure side, greater use of generic drugs and primary and community healthcare, and an affordable loan scheme for tertiary education to enable rising demand to be met at reasonable cost." 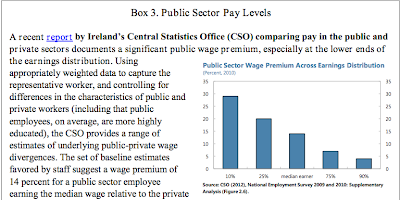 Further, per box-out on Health costs overrun: "there is scope for increased cost recovery in respect of private patients‘ use of public hospitals"
Hence, per IMF, the Government should hit even harder privately provided pensions (on top of the wealth tax already imposed), thus undermining even more private pensions pools and increasing dependency on state pensions. 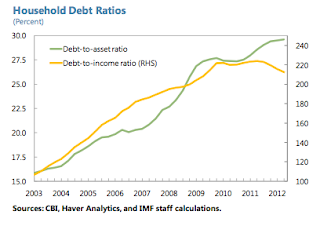 For those of us with kids, IMF - concerned with already unsustainably high personal debt levels - has in store more debt. This time to pay for our kids education. And for those of us with health insurance, there is more to pay too. Raise the demand for already stretched public services. This is the Willie Sutton moment for Ireland: the state (with the IMF blessing) is simply plundering through any source of money left in the country is a hope of finding a quick fix for Government insolvency. Now, with low hanging fruit already bagged, this process is starting to directly impact our ability to sustain private debts. But no one gives a damn! As Sutton, allegedly claimed, it makes sense to rob banks, because that is where the money are. Alas, with banks out of money, the Government, prompted by the IMF 'advice' is going to continue robbing us. So a message to our Pensions industry, which hoped that going along with expropriation of customers' funds via pensions levy would allow the industry to avoid changes to tax incentives on pensions (the blood of the sector demand). Prepare for tax reliefs savaging. Once you fail to stand up to the bullies and protect the interests of your customers, you deserve what you are going to get. Every bit of it. London, 19 December 2012 -- The performance of the Irish prime residential mortgage-backed securities (RMBS) market steadily worsened during the three-month period leading to October 2012, according to the latest indices published by Moody's Investors Service. From July to October 2012, the 90+ day delinquency trend and 360+ day delinquent loans (which are used as a proxy for defaults) reached a new peak, rising steeply to 16.52% from 15.19% and to 7.91% from 6.58%, respectively, of the outstanding portfolios. Moody's annualised total redemption rate (TRR) trend was 2.95% in October 2012, down from 3.40% in October 2011. Moody's outlook for Irish RMBS is negative (see "European ABS and RMBS: 2013 Outlook", 10 December 2012,http://www.moodys.com/researchdocumentcontentpage.aspx?docid=PBS_SF309566). The steep decline in house prices since 2007 has placed the majority of borrowers deep into negative equity. Falling house prices will increase the severity of losses on defaulted mortgages (see "High negative equity levels in Irish RMBS will drive loan loss severities to 70%", 16 May 2012 http://www.moodys.com/viewresearchdoc.aspx?docid=PBS_SF285527). 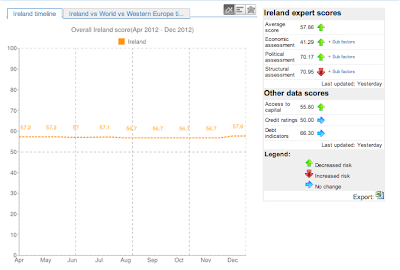 The rating agency expects that the Irish economy will only grow 1.1% in 2013 (see "Credit Opinion: Ireland, Government of", 07 November 2012 http://www.moodys.com/research/Ireland-Government-of-Credit-Opinion--COP_423933). In this weak economic recovery, it will be difficult for distressed borrowers to significantly increase their debt servicing capabilities and so arrears are likely to continue increasing. On 15 November, Moody's downgraded nine senior notes and placed on review for downgrade one senior note out of five Irish RMBS transactions, following the rating agency's revision of key collateral assumptions. 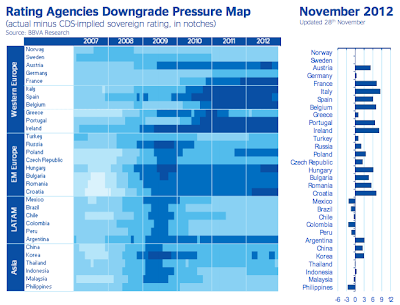 The downgrades reflect insufficient credit enhancement for notes rated at the country ceiling. All notes affected by this rating action remain on downgrade review pending re-assessment of required credit enhancement to address country risk exposure. Moody's also increased assumptions in eight other transactions, which did not result in any rating action due to sufficient credit enhancement. 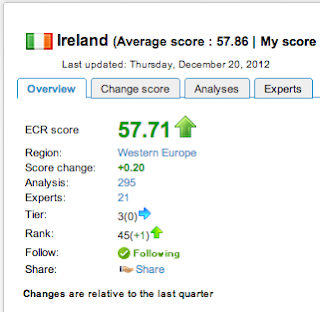 (See PR: http://www.moodys.com/research/Moodys-takes-rating-actions-on-5-Irish-RMBS-transactions--PR_259945). As of October 2012, the 19 Moody's-rated Irish prime RMBS transactions had an outstanding pool balance of EUR48.97 billion. This constitutes a year-on-year decrease of 7.1% compared with EUR52.69 billion for the same period in the previous year." So, that's EUR48.97 billion of trash which are 7.91% fully destroyed and decomposing (EUR3.87bn) and is showing signs of severe rot at 16.52% (EUR7.96bn). With 70% expected loss, at EUR8.28bn expected writedown, swallowing all funds allocated under PCARs to mortgages arrears? Keep on reading the IMF report, folks. Nice little bots on offer regarding the fiscal programme performance. "A combination of slower growth, higher unemployment, and the over-run in health spending, have dimmed prospects for any significant fiscal over performance in 2012. Indeed, given the weak economic conditions, only about half of the 6 percent of GDP consolidation effort over 2011-12 has translated into headline primary balance improvement. [Meaning that we've been running into a massive headwind, with pants caught on rose bushes behind us...] Nonetheless, the authorities‘ consistent achievement of the original program fiscal targets despite adverse macroeconomic conditions gives confidence in their institutional capacity and commitment to consolidation." "The program envisages additional consolidation of 3 percent of GDP over 2014–15. Taking into account the measures already specified for these years (such as on capital spending), and carryover savings from earlier measures, new measures of about 1½ to 2 percent of GDP remain to be identified for 2014-15. In other words, the Government will have to find somewhere around €3-3.2bn more cuts/tax hikes in 2014-2015 on top of those already factored in for 2013. Enjoy the above - you can enlarge the text by clicking on the images. "Bank lending has remained weak. Lending flows have fallen to new lows, with gross mortgage loans to households down 10.3 percent y/y in the first three quarters of 2012 and new SME loan drawdowns (excluding financial intermediation and property-related) down 20.7 percent y/y in first half. 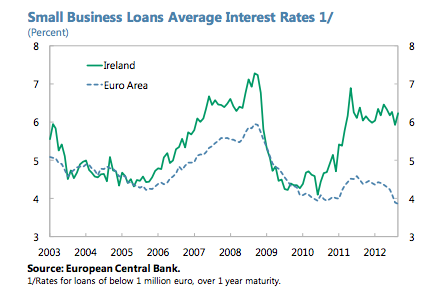 Interest rates on SME loans (proxied by loan agreements below €1 million) remain well above euro area average levels." So as the economy is starving for credit, irish banks - heavily subsidized by ELA and ECB funding (see below) are gouging SMEs for every last bit they can squeeze. Jobs creation in this environment? You gotta be kidding! Their dependence on these sources is still extraordinarily high. Taken in conjunction with lack of lending to the SMEs, the above suggests that what Ireland needs is not just an EU buyout of banks debts carried by the Exchequer, but also a special funding provision arrangement, which can allow Irish banks to retain high ELA/ECB exposures for at least 5-10 years, to allow economy some breathing room to pay these down. Gross NPLs (Non-Performing Loans) meanwhile rose from €42.1bn (17% of Gross Loans) to €53.0bn (23.1% of Gross Loans), so te loans provisions amounted to 46.3% of NPLs in 2011 and now account for 50% of NPLs. However, Net NPLs to net equity ratio has risen dramatically from 68.6% to 109.3%. In other words, equity cushion is being depleted once again, especially as continued accumulation of NPLs coincided with drawdowns of net equity from €32.9bn to €24.2bn. More form the IMF: "For the first three quarters of 2012, these banks reported a €0.8 billion pre provision loss excluding non-recurrent items (-0.3 percent of average assets) and, under their restructuring plans, they are not expected to break-even until 2014. Although these banks remain well capitalized, with Core Tier 1 ratios of 15.5 percent of risk-weighted assets and 7.5 percent of total assets, these buffers are expected to decline as loans are worked out and will be further eroded if operational losses persist." Financial reform benefits. In the wake of an exceptionally deep financial crisis, with impacts across the system, financial sector reform challenges remain substantial, and there is uncertainty around the timing and magnitude of the benefits of financial sector reforms for reviving banks‘ profitability and capacity to lend to households and SMEs. Debt overhangs. Government debt is set to peak at some 122 percent of GDP, household debt is 209 percent of disposable income, and many SMEs are burdened by property-related loans. These debts drag on growth through private deleveraging, reduced access to credit at higher cost, and concerns about future tax burdens. Bank-sovereign loop. These debt stocks are compounded by still large contingent liabilities from the banking system in a scenario where weak growth reduces asset values and heightens loan losses. As a result, the challenges for sovereign and banks in accessing market funding are interlocked, magnifying the growth uncertainties. Fiscal drag. Fiscal consolidation will continue to be significant in coming years, with the growth impact depending on the composition of measures and also on external economic conditions and progress in easing credit constraints." recovery. Such setbacks in Ireland would exacerbate the broader euro zone crisis..."
new capital needs in the financial sector." In other words, were we to so see fiscally-induced and debt-overhang enabled structurally lower growth (at current rates), the debt crisis can lead to a new capital call from the banks on the Government. In this light, all the Government talk about 'improved' banking operations are, frankly put, tripe. So IMF released 8th review of Ireland's programme (link) and just as I speculated here two days ago, the Fund is loading the bases with stronger and stronger language on dithering EU's failure to deal with irish Government debt overhang arising from the banking sector measures. "Ireland’s remaining vulnerabilities imply that prospects for durable market access depend importantly on the delivery of European commitments. Market conditions for Irish sovereign debt are much improved following the announcements of the ESM direct bank recapitalization instrument and of OMT. But the feasibility of retroactive application of the ESM instrument for Ireland remains unclear as do the conditions for OMT qualification. 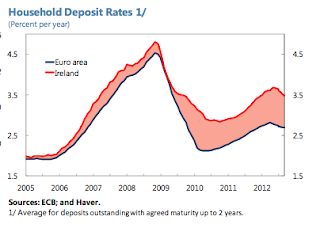 Given Ireland‘s high public and private debt levels and uncertain growth prospects, inadequate or delayed delivery on these commitments poses a significant risk that recently started market access could be curtailed, potentially hindering an exit from official financing at end 2013." "Management of the risks to market access, and hence to meeting the exceptional access criteria, depends on continued strong program performance and also on delivery of euro area commitments." I agree with the Fund. Ireland has done enough under the programme to move us toward exiting the funding arrangements (whether that is desired or not, is a different question). However, EU institutions (namely ECB and - via absence of support for Ireland - EU Commission) have first forced Ireland into the current insolvency, and then proceeded to stonewall us in the search for workable solutions. As promised in my first post on Q3 2012 National Accounts, here are the details of the main components of Irish GDP and GNP with more short-term trends focus (first post focused on cumulated changes for the 9 months from January through September 2012). Unfortunately, these short-term series are less impressive than cumulated series. Here's why. Agriculture, Fishing & Forestry (AFF) subsector posted €564 million worth of activity in Q3 2012, down €477.o million (-45.8%) on Q2 2012 and down €123 million (-17.9%) y/y. This marks the second consecutive quarter of y/y declines, which technically means that the sector is in a recession. AFF sector overall share of GDP is now 1.41%, so it is a minute contributor to the GDP dynamics. Industry activity printed at €8,868 million in Q3 2012, down €1,659 million (-15.8%) q/q and down 4.0% y/y. 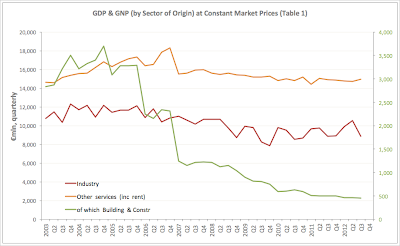 Only about 1/4 of the overall decline in Industry activity came from Building & Construction sub-sector which posted another fall-off in Q3 compared to Q2 (down €17 million or -3.7% q/q and down 9.9% y/y). 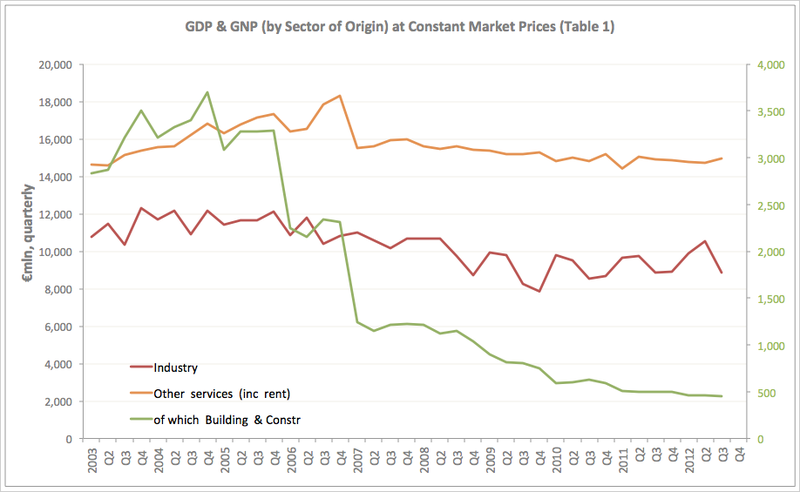 Overall Industry share of GDP is now at 22.15% so any movement in the sector activity is significant for headline GDP and GNP. Distribution, Transport and Communications (DTC) sector expanded to €8,940 million in Q3 2012 (up €1,071 million or +13.6% q/q and up 1.8% y/y). The sector now accounts for 22.33% of GDP. Public Administration and Defence (PAD) sector showed €37 million (+2.1%) q/q expansion in Q3 2012, printing at €1,823 million. Y/y the sector is down 4.1% (just €78 million in net reductions). The sector now accounts for 4.55% of our GDP. Other Services - a sector accounting for 37.4% of our GDP - increased activity by €239.0 mln (+1.6%) q/q and are up 0.3% or €47 million y/y. Compared to Q3 2007: Agriculture, Forestry and Fishing sector activity is down 27.4% (-€213mln); Industry activity is down 12.8% (-€1,298mln), of which Building & Construction is down 63.1% (-€765mln); Distribution, Transport and Communications sector is up 25.8% (+€1,832mln); Public Administration and Defence is down 14.9% (-€318mln); Other Services are down €980mln or -6.1%. Taxes net of subsidies rose to €3,998 million (+€353mln and +9.7% q/q) and are up €48mln (+1.2%) y/y. 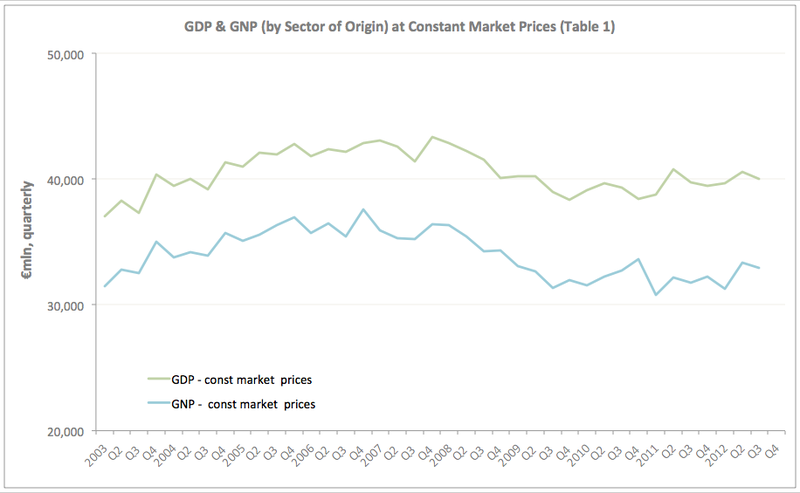 Thus, GDP at constant market prices was down to €40,041 million in Q3 2012 (down €512mln or -1.3% q/q) and up €320mln (+0.8%) y/y. 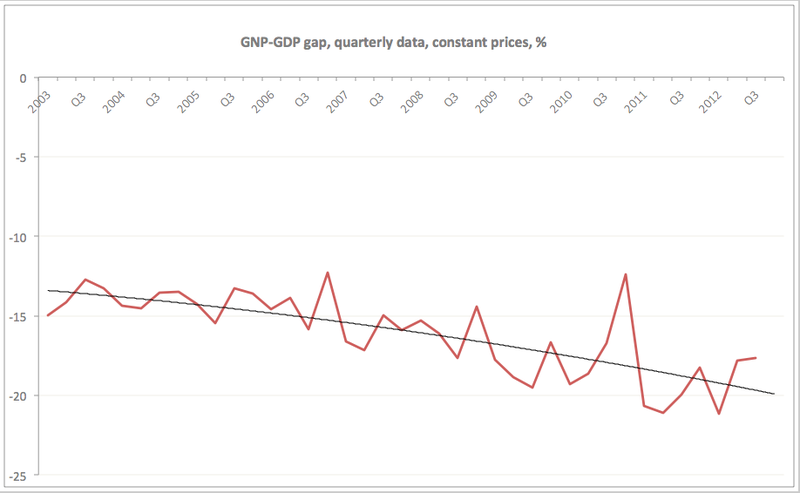 Compared to 2007 levels, GDP is down 3.3% (_€1,3540mln). 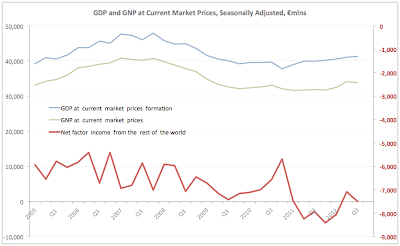 Net factor income from abroad contracted by €154mln in Q3 2012 (-2.1% q/q) compared to Q2 2012 to -€7,069mln. Year on year outflows are down €859 million or -10.8%. However, net outflows abroad are still up 17.2% (€1,038mln) on 2007. Currently, net transfer from Ireland abroad amount to 17.65% of our GDP. With reduced outflows to the rest of the world (primarily driven by falling transfer pricing by multinationals), our GNP in constant market prices still contracted by €358 million (-1.1%) q/q. In Q2 2012 it grew by €2,075mln (+6.6%) q/q. The robust growth in Q2 was partially offset by the decline in Q3. Year-on-year our Q3 2012 GNP is still up +€1,178mln (+3.7%). 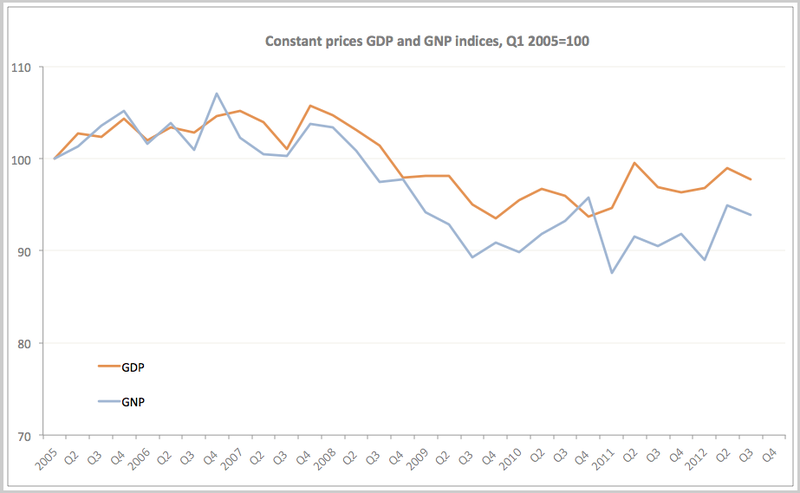 However, compared to 2007, Q3 2012 GNP is down €2,237mln (-6.4%). 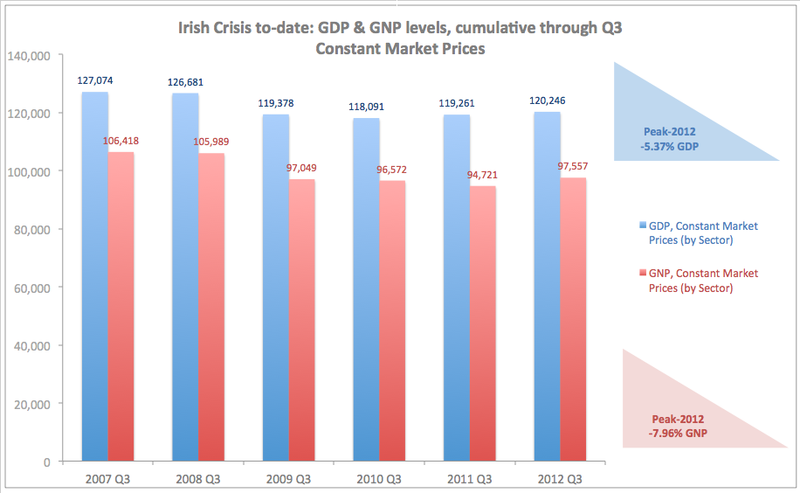 As the result of the above, Irish GDP/GNP gap decreased slightly from 17.81% in Q2 2012 to 17.65% in Q3 2012. Personal Consumption of goods and services rose €160mln (+0.8%) q/q and is up €367mln (+1.8%) y/y. However, this is not the first time that personal consumption increased since the beginning of the crisis. For example, it rose €335mln in Q1 2010-Q3 2010 and by €420mln in Q3 2011-Q4 2011. In real, seasonally-adjusted terms, our personal consumption of goods and services is now at the levels between Q4 2005 and Q1 2006. However, some of this 'support' for consumption is coming from significant price increases in state-controlled sectors, which are not linearly reflected in GDP deflators (price adjustments). 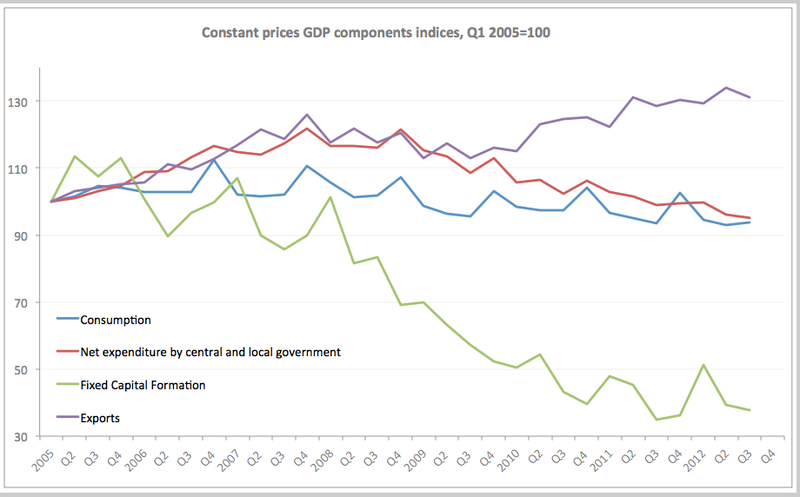 Net expenditure by central and local government decline €4 million to €6,204 million in Q3 2012 compared to Q2 2012 (-0.1% q/q) and is now down €172 million y/y (-2.7% y/y). 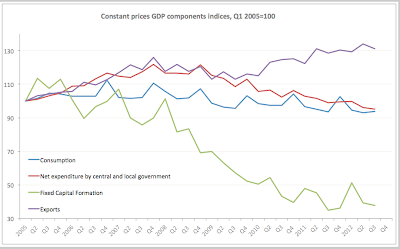 While Personal Consumption fell €3,013 million (-12.8%) in 2007-2012 Q3 on Q3, Government spending declined €1,132 million (15.4%) over the same period of time. 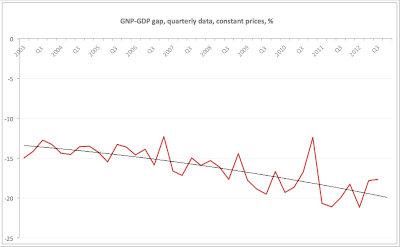 At annualized rates, this means a decline of personal consumption contribution to GDP of some €12 billion per annum and a decline of Government spending contribution to GDP of some €4.5 billion per annum. 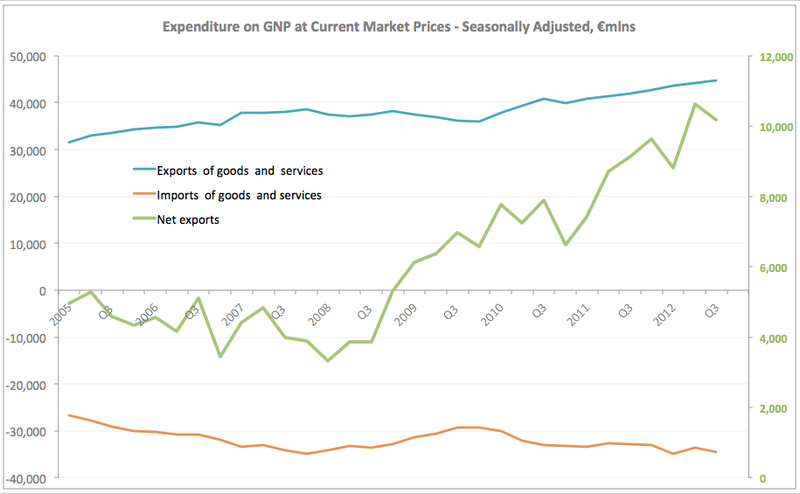 Irish Government expenditure in real terms is running at the levels comparable with Q1-Q2 2006, or a quarter ahead of where personal consumption rests. 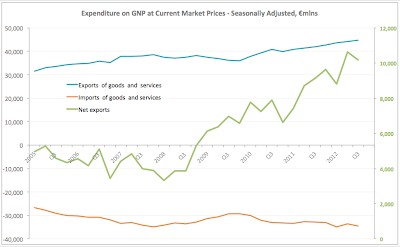 However, any biases induced to personal consumption upside from state-controlled price increases also act to generate superficially lower government spending reported here (as this is Net expenditure by the government, excluding taxes and receipts). 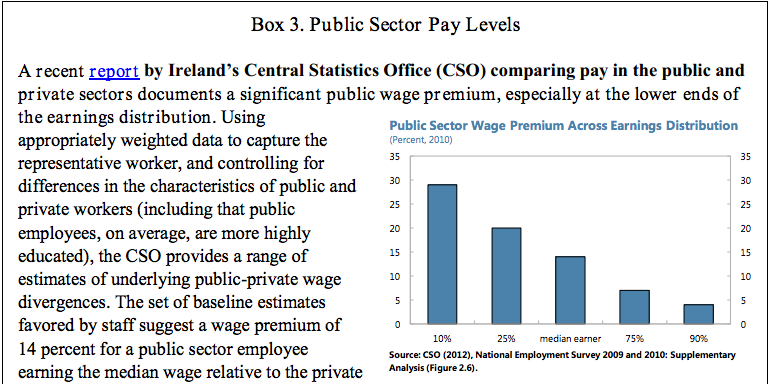 In other words, the true difference between Government and private spending is most likely much wider than one quarter. Gross domestic fixed capital formation improved in Q3 2012 compared to Q2 2012, rising to €3,962mln (+€315mln or €8.6% q/q), which resulted in an annual increase of €323mln (+8.9%) y/y. Still capital formation is down €7,432 million (-65.2%) on Q3 2007. Our fixed capital formation is now running at just 40% of Q1 2005 levels. Exports of goods and services rose 1.3% (+€567mln) in Q3 2012 compared to Q2 2012 (increase of €2,788mln or +6.7% y/y). Imports are up €1,005mln (+3.0%) q/q and are up €1,742 mln (+5.3%) y/y. Compared to Q3 2007, exports are now up 17.3% (+€6,598mln) and imports are down 1.2% (-€404mln). Irish exports now account for 108.01% of our GDP and our imports are at 83.38% of GDP. Irish GDP rose €310mln (+0.8%) q/q and €1,464mln (+3.7%) y/y, but GDP remains deeply below Q3 2007 levels (-€4,632mln or -10.1%). 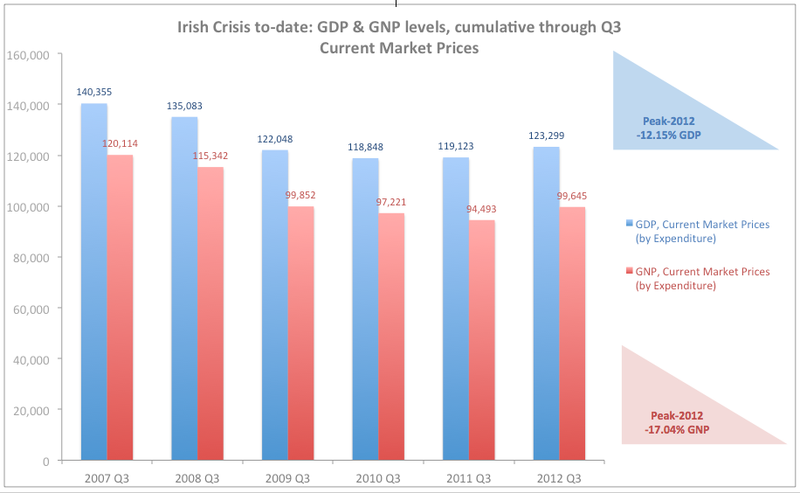 Irish GNP shrunk €245mln (-0.7%) q/q and is up €1,909mln (+6.0%) y/y. GNP remains deeply below Q3 2007 levels (-€6,357mln or -15.8%). Some positive news today on a major front with the release of Q3 2012 preliminary QNA estimates. Headlines are good, predominantly. Here is a post covering cumulated Q1-Q3 data for 2007-2012. More detailed analysis of dynamics in QNA components later tonight. 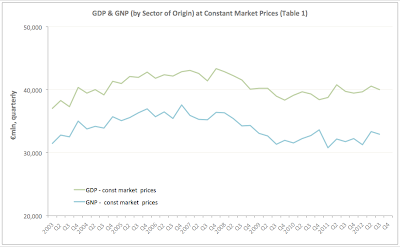 Irish GDP in Constant Market Prices rose from €119.261 billion in 2011 to €120.246 billion, implying y/y growth rate of 0.826%. Irish GNP also increased, from €94,721 million in 2011 to €97,557 million in 2012 yielding a y/y growth rate of 2.99%. In nominal terms (current market prices), Irish GDP was up from €119.123 billion to €123.299 billion (+3.506% y/y), while Irish GNP increased from €94.493 billion to €99.645 billion (+5.452% y/y). 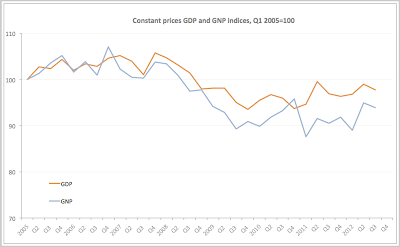 Compared to peak, Irish GDP in constant prices terms is still 5.37% below the level attained for Q1-Q3 2007, while in current terms it is 12.15% down on the peak. Compared to peak, Irish GNP in constant prices terms is down 7.96% and in current market prices terms it is down a massive 17.04%. 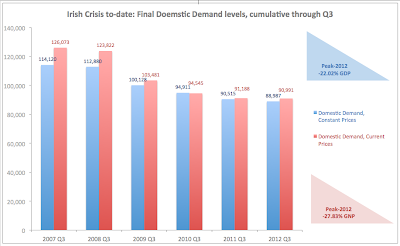 Final Domestic Demand in constant prices terms fell in the nine months from January 2012 from €90.515 billion in 2011 to €88.987 billion (-1.69% y/y). 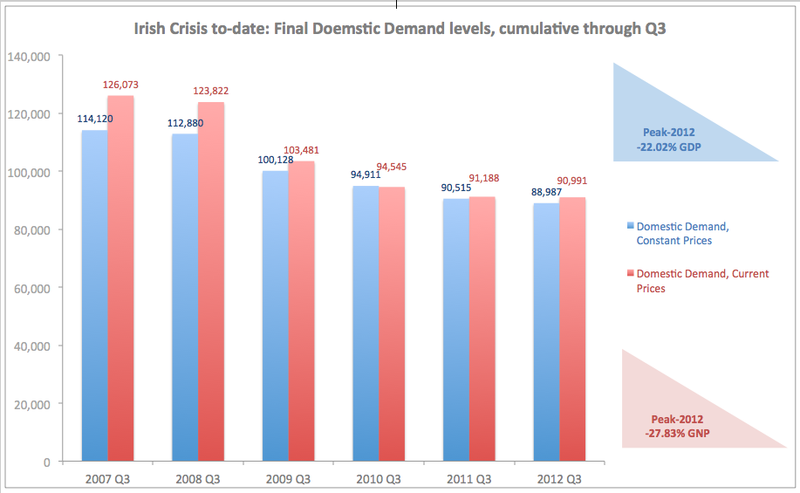 Final Domestic Demand in current prices terms also fell in the nine months from January 2012 from €91.188 billion in 2011 to €90.991 billion (-0.21% y/y). Final Domestic Demand in constant terms is currently down 22.02% on 2007 (Q1-Q3) cumulative levels and is down 27.83% in current prices terms. More on sub-series dynamics later tonight. 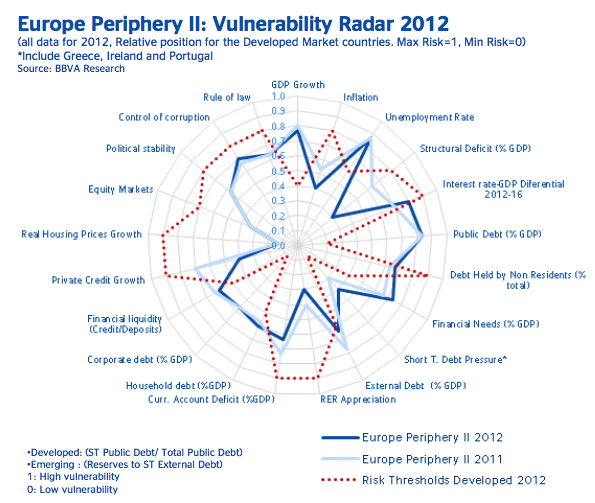 In 2013, euro area crisis focus will remain on the peripheral countries, with Spain and Portugal taking the front seat from Greece in terms of potential risks in the first half of the year. 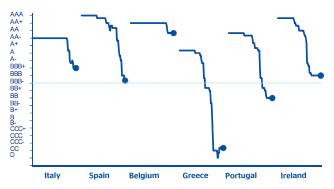 In particular, Spanish and Portuguese budgetary dynamics, rising unemployment and continued economic recession are likely to act as destabilizing factors in relation to both the ECB OMT programme and the ESM funds. 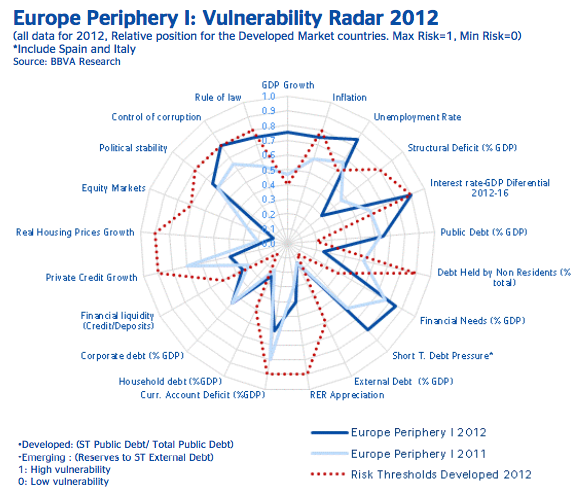 Italian political and budgetary dynamics are likely to show serious strains in the early part of 2013, with growth deterioration pushing Italian risks up in the second half of the year. By the second half of the year, Greece also is likely to return to the top of the risk charts in Europe, posting continued deterioration in economic conditions, catastrophic upward creep in unemployment and new evidence of non-sustainable medium-term fiscal dynamics. Aside from the three weakest countries, Ireland will likely remain at the bottom of the peripheral risks ranks with stagnant economic activity and relatively stable unemployment. 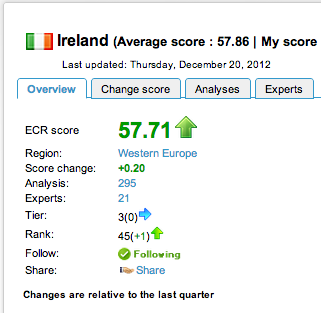 Latest credible headline forecasts on Ireland's performance for 2013 are here, and these (IMF's ones) are optimistic, in my view. 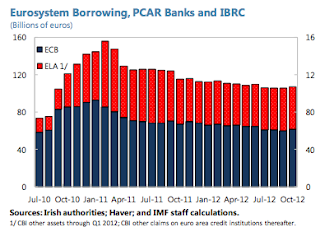 Ireland's risk is likely to rise toward the end of 2013 as reformed personal insolvencies regime starts adversely impacting banking and household balancesheets on mortgages writedowns side. 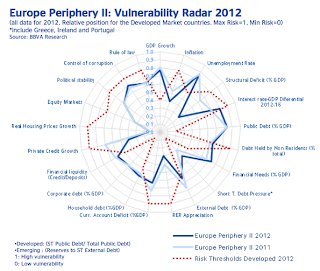 Budgetary performance in Ireland will also come under significant pressure as targets set out in Budget 2013 are likely to show signs of stress in the second half of 2013. Nonetheless, Irish situation will remain at the back burner of European attention as Italy and Spain (which together will have to raise some €500 billion in bonds in 2013) are likely to be the main drivers of risks. In all peripheral countries, continued slowdown in the rate of unemployment growth will be consistent with massive exits from the workforce and rapid deterioration in employment. This will put more strain on the fiscal dynamics and growth. On the core EA17 side, German political cycle is likely to introduce more uncertainty. Elevated levels of protectionist rhetoric during German elections campaigns of 2013 are likely to adversely impact euro area's capacity to continue kicking the proverbial can of 'peripheral solutions' down the road, potentially exposing internal divisions within the euro area and amplifying crisis impact on euro area economies and markets. 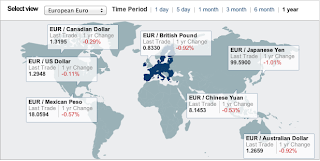 Strong euro is likely to weigh on German exports and, although, I do not expect a full-blow recession in Germany in 2013, growth is likely to be subdued and labour markets pressures will start appearing. Two countries with potential for generating unexpected newsflows are Belgium and the Netherlands. Belgian and Dutch economies are currently struggling with excessive debt levels - a struggle that is neither new, nor abating. In particular, Belgium can experience a twin shock of continued and deepening economic contraction and a political crisis, pushing the country into another period of political uncertainty. The Dutch economy is clearly open to the threats of prolonged economic recession, political instability and household debt crisis amplification. 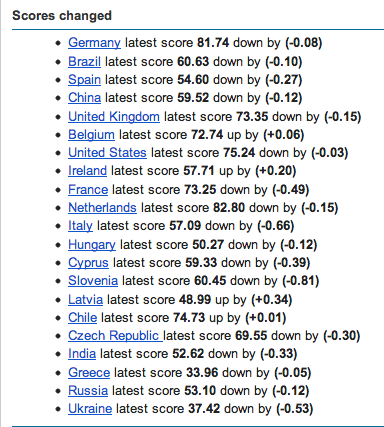 The Netherlands are currently on negative watch for the country Aaa ratings and this can easily translate into a ratings downgrade should negative growth persist well into 2013. This is consistent with projections of 20-25% decline in property prices in an economy that is a debt bubble that has been deflating relatively softly. The US Fiscal Cliff is likely to remain a threat into Q1 2013, with only patchwork solutions emerging, supported by the Fed's QE4. I do not expect to see a structural bipartisan resolution of the underlying deficits and debt crises in 2013, which means that the Fed will retain accommodative monetary stance to support sub-trend yields on Government debt. The downside risk to the above 'muddle-through' scenario of Washington stalemate is the effect of the general upward tax creep during the first year of the second Presidential term. Expiration of tax breaks and tax increases at the federal, state and local levels will weigh on the economy, holding back recovery. Capex is likely to see a false start in H1 2013, with fiscal cliff and debt stalemate pushing domestic investment back down in H2 2013. This means that 2013 growth is likely to peak around Q2-Q3 2013 and slow once again in subsequent quarters. Still, owing to aggressive monetary stance and internal households' deleveraging dynamics, the US economy is likely to significantly outperform other G7 economies in 2013. Globally, the BRIC economies are expected to outperform advanced economies in terms of economic growth and structural macroeconomic stability risk parameters both in 2012 and in 2013. In this sense, the BRICs overall position in the global economy in 2013 is likely to remain as the core centre for generating growth. However, within the BRIC group, at least three of the four economies, namely Brazil, China and India represent potential sources for 'grey swan' high-level macro risk events. China represents the biggest 'grey swan' in the global growth risks context. Chinese economy is yet to embark on significant banks' and households' balancesheets repairs and this risk is coincident with the political dislocation created by the change of leadership. New, more conservative and less economically-capable leadership is likely to continue the course of attempting to prop-up insolvent banking and property markets. Military-industrial spending and funding for insolvent local authorities are likely to see gradual increases. Upside to this policy stance is that domestic demand is likely to remain relatively strong. Downside is the reduction in the rate of growth in private investment and crowding out of private investment with public spending. The greatest downside risk for China, the region and the global economy remains the Chinese property bubble (now firmly contaminating Hong Kong and Singapore, as well as spilling into Australia and New Zealand) and the levels of indebtedness in the corporate sector, with a knock on effect to the assets quality on Chinese banks' balancesheets. Repairing Chinese banking sector will require major restructuring of industrial enterprises-connected banks and smaller banking institutions. The Government might have some appetite for aggressively engaging with this, but the resources expanded on repairing banking sector will be wasted in a liquidity trap. 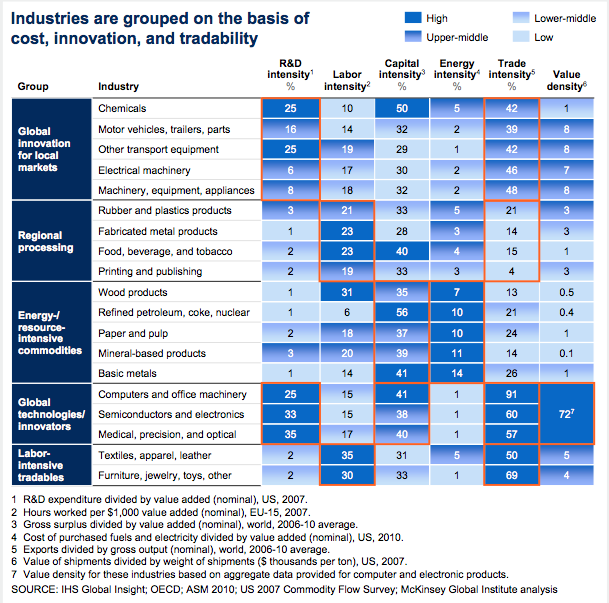 The second downside risk is a long-term unravelling of the Chinese competitive advantage. Increased domestic demand and re-orientation of growth drivers toward internal markets imply upward pressure on wages and downward pressure on productivity. At the same time, current recovery in Chinese trade flows with the rest of the world is mainly concentrated in the cost-sensitive sectors of basic manufacturing. To regain trade-based growth momentum, China requires continuous move up the value chain in exports, a movement that is constrained by domestic refocusing of its economy. While 2013 is unlikely to be a catalyst year for Chinese economic crisis materialization, the imbalances continue to build up and it is only a matter of time before China is propelled to become the source of global risk rivaling in this role the euro area. Brazil, currently the darling of the Latin American growth story, is severely exposed to two risks, both of which can materialise in 2013, although once again, the probability of these is relatively low. 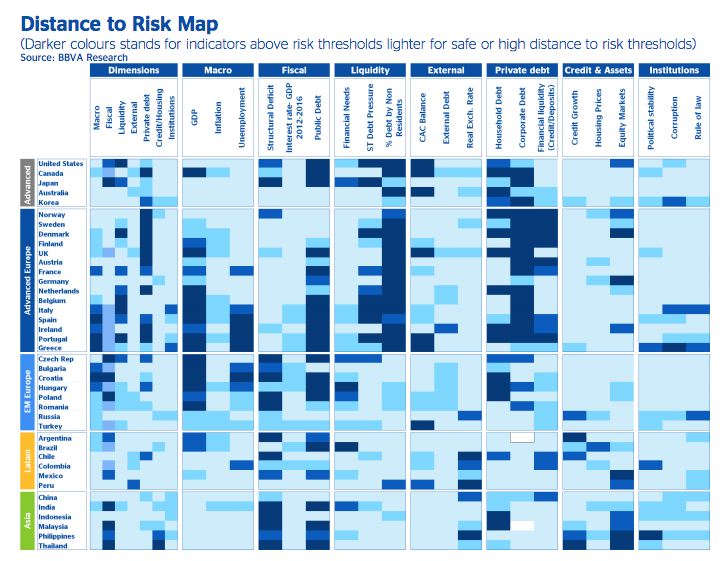 The first risk relates to the heavy dependence of Brazilian investment story on oil revenues potential. Structural moderation in oil prices is likely to make much of Brazil's oil reserves unviable from commercial exploration perspective before production begins on its offshore fields. 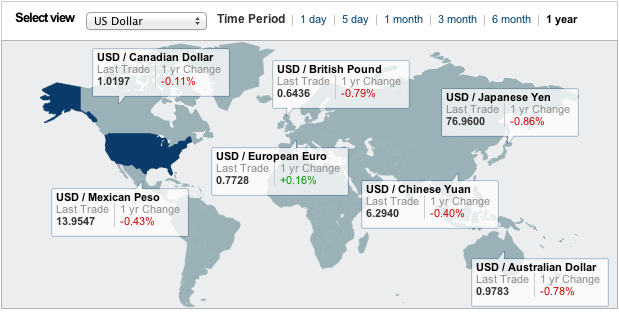 This risk can materailize in 2013 if oil prices were to settle into a long-term trend around USD80 or lower. In terms of growth, I expect Russia to outperform Brazil in 2013, although the current gap in growth rates is likely to close substantially. In 2011-2012, Brazil average real growth rate of GDP is likely to reach 2.1% against Russia's 3.9%. In 2013, my forecasts suggest Russian growth of 3.7-3.8% against Brazil's 3.5-3.6%, against global growth of 3.6% projected by the IMF for 2013. This is an impressive performance in the case of Russia, given that the country currently enjoys GDP per capita (adjusted for purchasing power parity differences) of D17,698 (as measured in International dollars) against ID12,038 for Brazil, ID9,146 for China and ID3,851 for India. 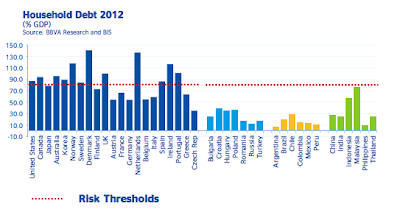 Russia will continue closing its income gap with the euro area in 2013-2017. In 2010, Russian GDP per capita (adjusting for price difference and exchange rates variation) stood at 47.9% of the euro area. 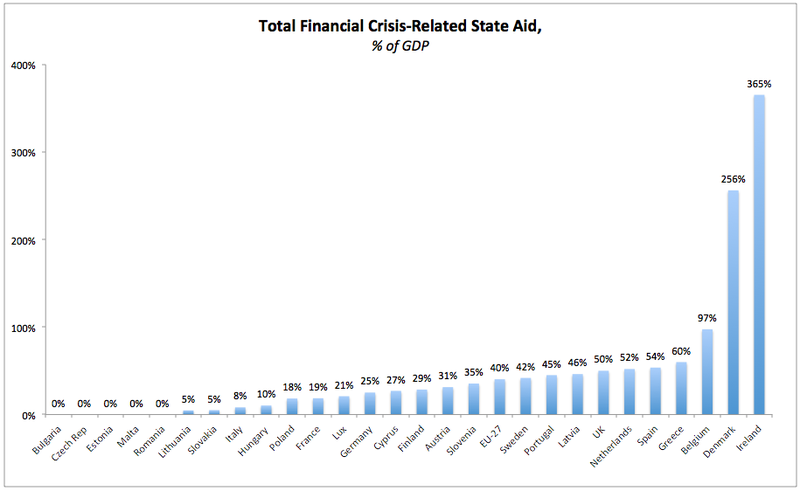 This is expected to rise to 54.1% in 2013, reaching 60.7% by 2017, according to the IMF projections. 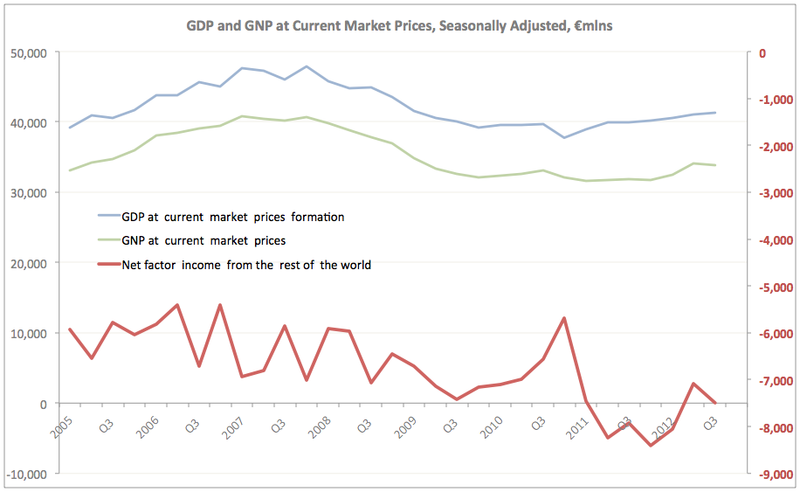 Russia's relative position as the wealthiest economy of all BRICs is further reinforced by the fact that aggregate investment and savings in the country are set to remain ahead of those in Brazil in 2013, continuing the trend established since the beginning of the Great Recession, and this trend remains independent of the Government sector. In the shorter run, 2013 developments are likely to benefit from recent improvements in financial instrumentation, namely the push by the Russian authorities to expand clearance systems access for Russian government and corporate bonds. 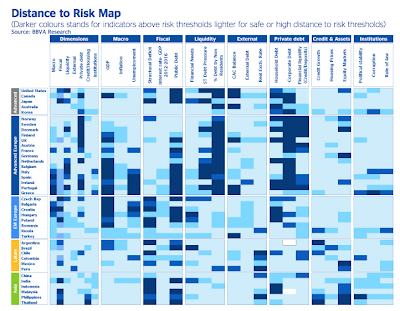 The risks to the above forecasts are to the downside and focus primarily on changing trends in world gas prices, alongside the risk of continued stagnation in major trading partners (euro area) or continued economic growth slowdown in China feeding through to moderation in prices for basic energy and industrial commodities. However, these risks are less likely to impact ver significantly the Russian economy in 2013 and are more present on the longer-term horizon of 2014-2015. No, this is not a joke, but, put in econo-astronomical terms, the Universe is amidst a Great Depression. "In the largest ever study of its kind, the international team of astronomers has established that the rate of formation of new stars in the Universe is now only 1/30th of its peak and that this decline is only set to continue..."
"Much of the dust and gas from stellar explosions was (and is still) recycled to form newer and newer generations of stars. Our Sun, for example, is thought to be a third generation star, and has a very typical mass by today's standards. But regardless of their mass and properties, stars are key ingredients of galaxies like our own Milky Way." And here's the worrying bit: "By looking at the light from clouds of gas and dust in these galaxies where stars are forming, the team are able to assess the rate at which stars are being born. 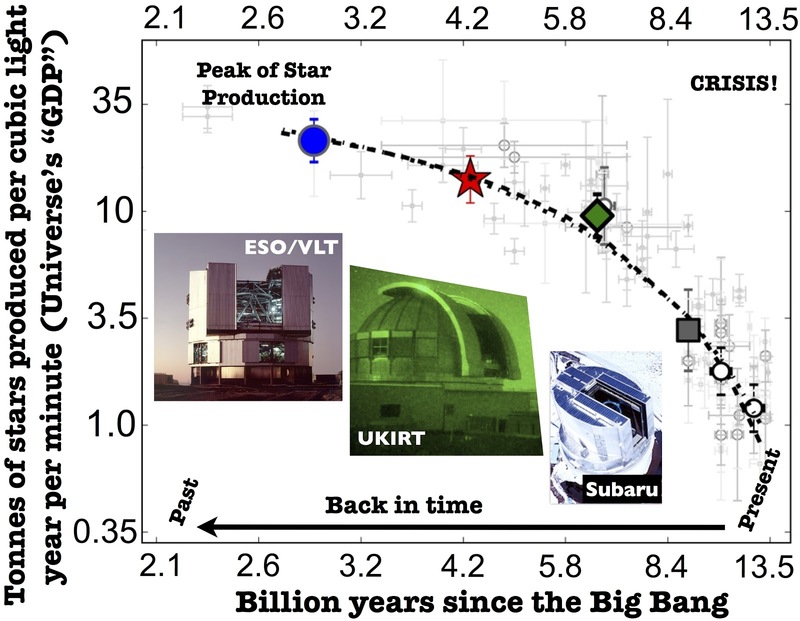 They find that the production of stars in the universe as a whole has been continuously declining over the last 11 billion years, being 30 times lower today than at its likely peak, 11 billion years ago. Dr Sobral comments: "You might say that the universe has been suffering from a long, serious "crisis": cosmic GDP output is now only 3% of what it used to be at the peak in star production!" 'If the measured decline continues, then no more than 5% more stars will form over the remaining history of the cosmos, even if we wait forever. The research suggests that we live in a universe dominated by old stars. Half of these were born in the 'boom' that took place between 11 and 9 billion years ago and it took more than five times as long to produce the rest. "The future may seem rather dark, but we're actually quite lucky to be living in a healthy, star-forming galaxy which is going to be a strong contributor to the new stars that will form." Now, what do we short to get a hedge on this macro? Full IMF statement on Programme Review for Ireland is linked here. Very positive, per usual, with some cautionary note at the end. I will quote that part, you can read the platitudes. "Looking ahead, however, a more gradual economic recovery is projected, with growth of 1.1 percent in 2013 and 2.2 percent in 2014, with public debt expected to peak at 122 percent of GDP in 2013. This baseline outlook is subject to significant risks from any further weakening of growth in Ireland’s trading partners, while the gradual revival of domestic demand could be impeded by high private debts, drag from fiscal consolidation, and banks still limited ability to lend. If growth were to remain low in coming years, public debt could continue to rise, in part reflecting the potential for renewed bank capital needs to emerge." Irish Government Budget 2013 is built on the assumed growth of 1.5% (0.5 ppt ahead of IMF forecast) in 2013 and 2.5% in 2014 (0.3 ppt ahead of IMF forecast). Government debt is forecast by the Budget 2013 to peak at 121% of GDP, against IMF forecast of 122%. Mr. David Lipton, First Deputy Managing Director and Acting Chair, said: "Vigorous implementation of financial sector reforms is needed to revive sound bank lending in support of economic growth. Key steps forward include arresting the deterioration of banks’ asset quality, reducing their operating costs, and lowering funding costs through orderly withdrawal of guarantees. The personal insolvency reform being adopted should facilitate out-of-court resolution of household debt distress, especially if complemented by a well functioning repossession process to help maintain debt service discipline and underpin banks’ willingness to lend." Note the renewed emphasis on repossessions. 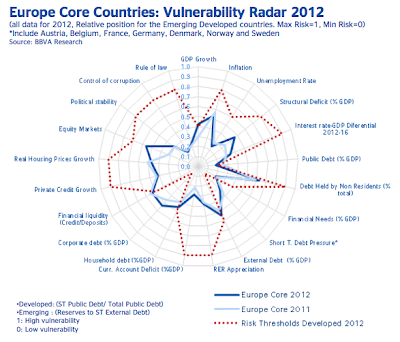 And to top it all, the IMF repeated a call for 'breaking the link between banks and the sovereign'. This marks a series of similar statements seemingly addressed at the EU leadership and I won't be surprised if the Fund were to focus on this issue much more as the EU continues to prevaricate on restructuring Irish debt. So ehre we have it, folks - homes repossessions and debt relief for the sovereign. Prepare for the Benchmarking 3.0 once that 'debt relief' is delivered, then.